We’ve all heard the saying that you are what you eat. While we’re not walking around looking like dinner plates, it’s easy to recognize that nutrition is important for general health. The same is true for the tropical fish in your aquarium. Fish will eat just about anything, but that doesn’t mean it’s a good choice for their health. They don’t always make wise eating decisions on their own, so you have to do it for them. It’s simple to choose the best tropical fish foods if you know what you’re looking for. If you just jump in blindly you might end up with something that’s cheap and doesn’t contain the nutrients your tropical fish really need. Not all fish are the same, but many common tropical fish have similar dietary needs with a few species-specific differences. You should check out what your pet store or your favorite online source has to say about the specific fish you own before you make any food decisions. The bottom line is that you want your fish to be beautiful, active, and healthy. For that to happen, you need to get them eating the right food on a regular basis. Learn about what fish need and how different foods try to meet those needs so you can get the best tropical fish foods to fit your unique aquarium. How many times a day should you feed tropical fish? How long can fish survive without food? How much food do you need to feed your fish? Fish foods come in a variety of shapes, with the most common being flakes, pellets, and whole. Flakes are dry, thin pieces of food that usually float on the top to allow fish to eat from the surface, until they get waterlogged and sink down. Pellets are thicker and usually barrel-shaped or circular. They can float on top of the water or sink slowly to the bottom. Whole food is food that’s made from whole plant or fish matter, such as frozen or live food. This is the most important part of tropical fish food. Understand your fish to know what kind of nutrients they need most and where those nutrients should be sourced from. Most fish foods derive their nutrients from plant or fish sources. 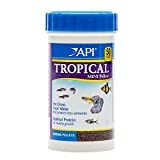 The best tropical fish foods generally have a mix of plant, bug, and, fish nutrients from high-quality, potent sources. Protein should always be the main nutrient in the mix. Fish need food that’s appropriately sized for them. Smaller fish need small food while larger fish need larger food. If you give small food to a large fish, they may not be enticed to eat it or they won’t be filled by it, if they even see it at all. Small fish cannot eat large food, and may injure their intestines if forced to eat food too large for them. For multiple sizes of fish, get different foods to suit them all instead of trying get them to eat the same size. You can get this Fluval fish food formula with small or medium-large pellets to help accommodate the size of your fish. The container has 1.6oz. of fish food pellets. Small pellets are suitable for baby fish, fry, and very small varieties of tropical fish while the medium-large pellets are good for fish that are a few inches long at most, not larger fish. Pellets are formulated to be slow-sinking for easy easting. Protein is largely derived from black soldier fly larvae and whole salmon. There is a minimum off 40% crude protein to fit the dietary needs of most tropical fish species. The black soldier fly larvae used is bred in smaller batches that help ensure a high-quality protein source in every container of food. No artificial colorants or flavors are added. Fluval claims that the food is naturally easy to digest and palatable for most fish. These are small packets of micro-granules that come as either a 1 or 2 pack of 0.77oz. packages. The granules are roughly shaped instead of having rounded edges, which makes them easier for fish to grab hold of and eat quickly. They are generally semi-floating, meaning they are suitable for most fish as they can be eaten from the top or as they slowly sink to the bottom. The granules will float for a decent amount of time on top of the water to allow surface eaters to get their fill. The nutrient mixture in the food is has fish meal and krill meal as the primary sources of protein, with cuttlefish meal and various algae and seaweed also providing extra protein. It has a crude protein minimum of 43%, with many essential vitamins and nutrients being mixed in as well. Artificial flavorings and colorants have been added to help your fish enjoy the food more and to bring out their color. This flake fish food is available in 0.42oz., 1oz., 2.2oz., 5.65oz., 7.06oz., 2.2lb., or 4.52lb. package sizes to help you be economical and efficient with your fish food needs. 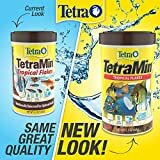 Tetra’s tropical fish flake food is made up of a collection of fish flakes in a wide variety of sizes from large to tiny. You can break them up smaller to feed smaller fish or leave them larger to accommodate medium-large fish. They are fully surface floating and will stay in the mid-feeding zone for a while before ever sinking. Protein in these flakes is derived from fish meal and dried yeast, as well as secondary sources like shrimp meal and algae meal. Many plant ingredients are used in the formula, including brown rice, what gluten, oat meal, potato protein, and dehulled soybean meal. The flakes are also fortified with a number of vitamins and minerals to support healthy and active fish. Composition of the flakes is solid enough to keep them from breaking up too much and clouding up the water during every feed. 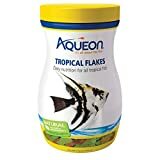 These tropical fish flakes from Aqueon come in 5 different container sizes: 0.45oz., 1.02oz., 2.29oz., 3.03oz., and 7.12oz. You can easily choose the right amount for your aquarium, fish load, and feeding preferences. The multi-colored flakes sit well on the top of the water to allow your fish to eat them from the surface as they please. Aqueon has formulated the flakes to not break apart as easily and not toe cloud up the water as much during feeding. There is a crude protein minimum of 41% in this flake formula. It’s mainly derived from whole fish meal (whole herring, salmon, and others) and plant-based sources. Secondary protein sources include whole dried krill, squid meal, dried yeast, and kelp meal. Only natural color ingredients are added with no artificial colorants in the mix. Vitamins and minerals are infused in the mix for a more complete dietary food. There are a lot of different options to help this food suit your aquarium’s needs. You can buy small, medium, or large pellets size, and you can choose between any of the following pellet styles: betta (floating), bottom feeder (sinking), cichlid (floating), tropical (sinking), mini tropical (sinking), goldfish (sinking), or large cichlid (floating). Each fish food container is 1.7oz. No matter the size of style of the pellets, they’re gently rounded to make them easier to digest and eat. Plant-based proteins are the main ingredients in the tropical mini blend, including wheat distillers, dried grains, and sunflower meal, with fish-based secondary proteins including squid meal, condensed fish protein digest, shrimp meal, and mussel meal. Dried waterflies are also included in the formula, along with added fibers, vitamins, and minerals. Each blend contains virtually the same ingredients with slight variations depending on the type of fish they’re intended for. Fish food can be made from almost anything. You can even drop fresh salad greens in your tank to add a little more nutrition to their diets. But, the type of food does matter. Things that are closer to a fish’s natural diet will be easier to digest and are more likely to provide the nutrients they need. Look for fish-based or bug-based protein sources and plant-based nutrients. While you can find fat and protein sourced from beef and other mammals, it’s not highly recommended as part of the regular diet because it’s more difficult to digest and could cause bloat. Reliable, trusted brands that have been in the fish business for years are a good choice if you have any doubt about what to buy. They’ve usually been working for a while to perfect their fish food formulas, leading to a lot of solid options that will provide the nutrition your fish need. Also, the larger brands tend to be more economical, even when using high-quality ingredients. There’s an ongoing debate on whether dried is better than frozen fish food. While frozen food is good in theory, it can have a higher water content than dried food. This means it won’t be as nutrient dense, making it a bad choice for the core part of a healthy diet. Frozen food is fine as a percentage of a regular diet, but sticking to a dried food for the main part is better nutrient-wise. Live food is a good option, however the only problem with live food is the possibility of a disease or parasite being transmitted through the food itself. Many trace nutrients are added to fish foods to beef up their nutrition. Don’t get too excited about most of these. Pay attention to the first three ingredients on the list. They need to be three strong protein sources (plant or animal-based), or else the food may not be giving enough protein for your fish. Protein should make up most of the mix, with other ingredients trailing behind it and a minimum of filler ingredients. You can feed your fish as many times a day as you want to. 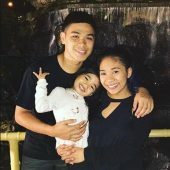 Feed them at least once daily, but it’s better if you can feed them in 2 or 3 mini sessions throughout the day to better simulate their natural eating habits. Most tropical fish can survive up to a week without food, although it’s not recommended to keep them from eating for more than 4 days unless you have to. Tropical fish can easily go 1 or 2 days without food, so don’t worry if you forget to feed them one day or you run out of food a few days before your next container comes in. Only feed your fish as much as they can eat completely within 2 minutes. When in doubt, it’s better to underfeed than to overfeed. If there’s uneaten food, make sure to remove it with a net. Excess food will make the tank dirty (visually and bioologically), lower the water quality, and can cause uncomfortable build-up in your fish’s intestines. It’s a little daunting looking at a long list of different fish foods when you’re not sure what separates one from the other or where to begin for your own fish load. I recommend starting with Fluval Bug Bites for tropical fish, because it’s a great high-protein food from a good source that works well for most fish.